Lots of excitement this morning in the South Shore neighborhood, where crews are filming the pilot episode for a spinoff of the popular TV show "Pretty Little Liars." The new show, called "Pretty Little Liars: The Perfectionists," is being shot by Warner Horizon Scripted Television for the Freeform channel. It will be set in a fictional town near Portland, according to location manager Shaun Gavin. Today's scenes are being shot around a swimming pool with a beautiful view of Oswego Lake. (An "intimate scene" was being filmed when The Review stopped by the set, so we were kept to the driveway out front.) On Tuesday, cast and crew will move to what Gavin called "a cute little bungalow" nearby to shoot interior scenes. Gavin said streets will remain open during the shooting, although parking is restricted. 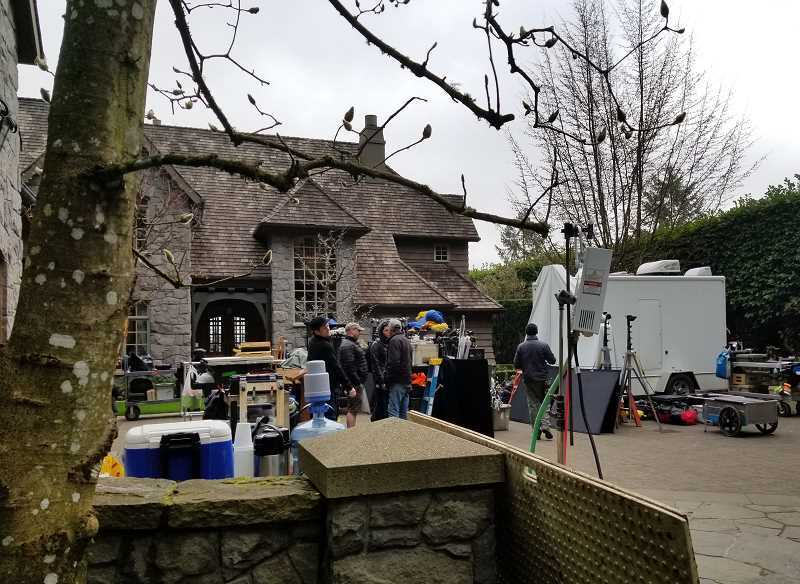 The production company is using the parking lot of the Lake Oswego United Methodist Church as a staging area for larger trucks and has rented several driveways in the neighborhood to keep its smaller vehicles out of the way. "The Perfectionists" will be the second spinoff of "Pretty Little Liars." It's based on the novel "The Perfectionists" by Sara Shepard and tells the story of the first murder in the picturesque town of Beacon Heights. Among the stars: Sasha Pieterse and Janel Parrish, who will reprise their "Pretty Little Liars" roles.